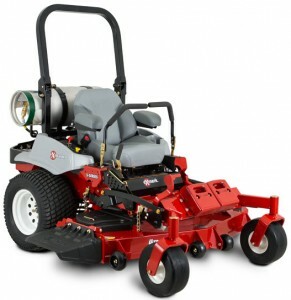 The Exmark Lazer Z S-Series propane mower includes an eco-friendly propane model featuring the innovative Kohler Command Pro EFI propane powerplant. Choose from UltraCut™ Series 4 cutting decks in 60- or 72-inches. A Panhard rod-style Deck Support System, adapted from NASCAR, reduces wear by eliminating deck sway and tranferring lateral forces away from deck struts. Exmark’s transport lock function makes it easy to feather the deck on uneven terrain. Keep the deck locked, or unlocked in the “Up” position for smooth, scalp-free feathering. Horsepower is meaningless if you can’t get that power to the ground. That’s why Exmark uses Carlisle Turf Master drive tires. Serious performance demands serious traction. The Lazer Z S-Series EFI Propane uses a 10.3-gallon (43.5 lbs) tank reduces necessary fueling stops. Maximum durability is delivered by a formed and continuously seam-welded UltraCut deck with a 10-gauge top, 7-gauge side skirt and welded spindle mounting sites. The full-floating deck design features 4-point suspension with 4 adjustable anti-scalp rollers for consistent scalp-free performance with Exmark’s signature cut quality.